Quality Be the best at what we do. Seek continuous improvement in all we do. Integrity Do the right thing. 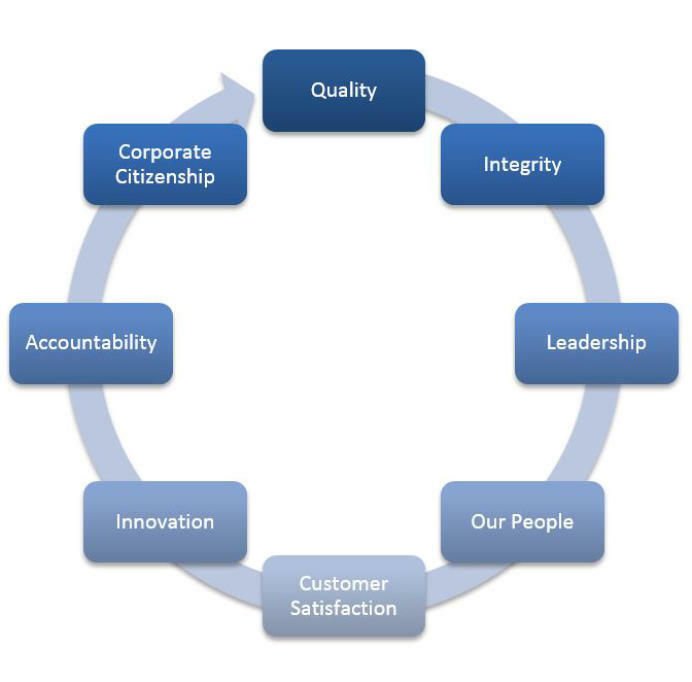 Perform to highest ethical standards and honor our commitments. Leadership World-class leaders and leadership development in all business levels. Our People Value the skills, strengths, perspectives and development of our diverse team. Foster a collaborative environment. Customer Satisfaction Understand what the customer wants and exceed expectations. Innovation Create greater value through innovative solutions. Accountability Take ownership. Aspire to do the right thing ALWAYS. Corporate Citizenship Provide a safe workplace for our employees. Work within our community and support worthy causes.